Last year, I watched Borat for the first time. That was the single most funniest piece of documentary film I had ever seen. 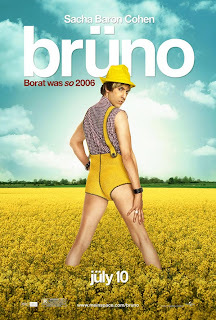 Coming from Sacha Baron Cohen, Bruno (2009), a film about a gay Austrian fashionista, had to be promising. I must admit, I had my doubts about it, would it be done tastefully or sickly? The latter proved to be the answer. This film was sick. It really made gay people look terrible. I mean, if that's the way some people are, then that's the way they are. But they didn't need Bruno exploiting their image. Throughout the film, I kept thinking: "Sacha Baron Cohen is engaged to that lovely actress Isla Fisher and has a young daughter. And how can he play such a bad character?" Yes, Borat was weird, but Bruno is even worse. The plot of this doco is Bruno wants to get famous, so he goes to America and tries everything from interviewing Paula Abdul to trying to become straight, 'because John Travolta and Tom Cruise are, that's why they're famous'. Some jokes are funny, but it's only a select few, so maybe I didn't get the rest of the 'funny scenes'. The thing about Borat was that he was socially retarded, he didn't get the American way of life at all and it was quite funny. But Bruno didn't get the American way of life and he didn't get the straight way of life. And this was just too much to handle in one movie. This was a good idea that didn't take off very well.